from Lynyrd, Katie, Kimchi and Starship! Thanks to EVERYONE, for making this blog, such a fun place to be, all year-round! Here's Wishing All Our Visitors, a Blessed Holiday Season, surrounded by Good Family and Friends... followed by a year filled with health, happiness and prosperity. Merry Christmas to all....and to all a good night. We wish you all a very happy and prosperous New Year!!! Congratulations on a really excellent year. I was the last person who thought I would be welcome or comfortable on this blog but just the opposite has proven true. 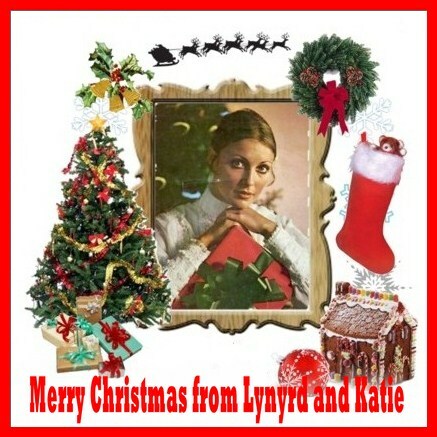 Gracias Lynyrd and Katie, Feliz Navidad. sorry, I'm cramming to learn Spanish for a trip. Hey Tom, you owe me a cheesesteak. Yes, what all y'all said. To Leary; Can I send a cheesesteak thru the mail? If Omaha Steaks and Kansas steaks ship meats I guess it can be done. Not wise of me to bet against Tim Thomas and the Bruins with a couple of our star players out. But you won fair and square. Hi Leary. It's funny that last time this year we were far from friends, but this year it's a complete U-turn. Just goes to show that all bridges can be mended if you try hard enough. Feliz Navidad to you!!! Usted está aprendiendo español? Bueno para usted!! Bueno trabajo!! Where are you going? Don't go too deep, you'll need more than Spanish. HA HA. Sorry, my Spanish is a little rusty. I took it in 8th and 9th grade, which was more years ago than I want to count. LOLOL! I think trabajo means I work. Would it be trabaje? You work? Or the familiar...tu trabajes? I need to conjugate Spanish verbs. LOL. Thanks Tom, St., Marliese, Leary, Mary & Carol. You guys are the BEST!!!! Very best wishes & Seasonal Greetings to all my fellow bloggers. And especially to Lynyrd, Katie, Kimchi & Starship for the great work they do in bringing us this Blog...and for making it a cool place to hang out, have fun & learn. Merry Christmas and Happy New year to all! Lynyrd, thanks for everything. You've done a real hell of a good job with this thing...there is good info to ponder, good discussion of issues and there will be even more to come after the new year! Me, I'm singing: "There's no place like MET LIFE STADIUM for the holidays" as I'll be at the Giants-Jets game on Christmas Eve. Look for me! As a Manson sometimes poster, I hope you and JimNY hook up. Nothing replaces a good time. Which I have had my share of! Merry Christmas Starship! Have fun!!! Merry Christmas!!! to everyone and a Happy New Year!!! Thanks to everyone, for their wonderful holiday wishes. I apologize for being so absent lately. Between work, and holiday preparations... I've had zero free time. The place was a mad house. I'll tell ya... it's not like the old Atari days, when there were 12 games to choose from! I've been working on a couple new threads... but, with the holiday so close... I'm not sure it's worth getting too deep into anything. I DO actually, want to watch that "Female Bunch" movie in the thread below. When I get a chance... I'll watch it, and write a brief review. If anyone else wants to watch the film, and submit their own review... that's cool too! I'd also like to thank everyone for joining in on this blog. Lynyrd and others make the threads interesting, but it's the bloggers who keep it going with interesting conversation! Thanks to EACH & EVERYONE of you who have contributed to this blog since its inception! Merry Christmas to everyone here! Be happy and be SAFE! Thanks Matt! Merry Christmas to you too!! Merry Christmas everyone. May you all always have a pack of cigarettes to puff away on! Thanks Stormy! Merry Christmas to you! Smoke, smoke, smoke that cigarette! LOL. Merry Christmas everyone. While we're all celebrating with our loved ones, take a moment to think of the families of Sharon, Jay, Steven, Voy, Abigail, Rosemary, Leno, Gary and Shorty. Their loves ones have spent many holidays without them. I wish everyone a wonderful holiday filled with all of the joy of the season. Venus! Have a great Christmas and Happy New Year! There will be lots of Dr. Pepper and popcorn in 2012!! LOLOL.